Alexandria, Va. — The Animal Welfare League of Alexandria took in six animals on Saturday from North Carolina after Hurricane Matthew swept through. 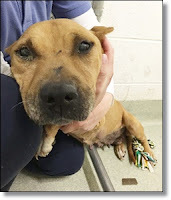 Earlier in the week, the group took in three other dogs from South Carolina. “It really does give you chills, the gravity of the situation really hits when you see such a large truck come in, the doors open, and so many beautiful faces,” said Abbie Hubbard, Deputy Director of the Animal Welfare League of Alexandria. 86 animals in total filled a truck from North Carolina, the AWLA opened their doors to a half dozen of them. 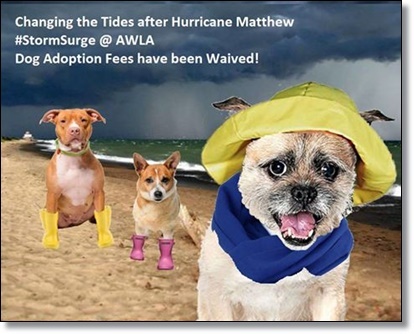 Your adoption of a dog today will be saving THREE lives in our #stormsurge event. The dog which you take today will finally have a home, which will make space for the transfers we receive from Carolina shelters, who then can turn around and save more displaced dogs in need of being rescued after #HurricaneMatthew. This week adoption fees have been WAIVED (excluding holding fees). Come by today to meet some of our fantastic friends!